Colombia’s war crimes tribunal is stuck in Congress over the more than 4,500 homicides committed by the military when Senator Alvaro Uribe was president. 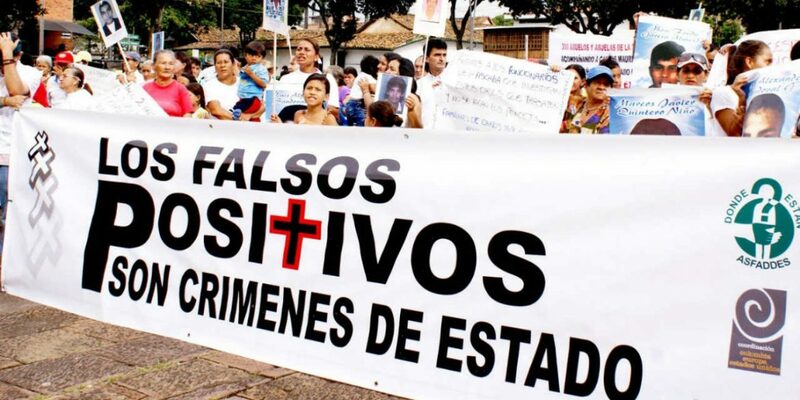 The Special Jurisdiction for Peace (JEP) took force earlier this year, but is still waiting for Congress to approve the allowed procedures to seek justice for Colombia’s 8.5 million conflict victims. The party of President-elect Ivan Duque, the Democratic Center (CD), has long claimed it opposed the JEP because it would grant impunity to the FARC, the former guerrilla group that demobilized 14,000 people last year. In Congress, however, the CD abandoned the FARC argument and said it would only agree to the JEP if the government agrees to suspend trials against members of the military accused of assassinating civilians. Impunity for state-sponsored mass murder? When Uribe was president between 2002 and 2010, the military executed between 4,500 and 10,000 civilians and pretended the victims were guerrillas killed in combat. Vice-President-elect Marta Lucia Ramirez was defense minister between 2002 and 2004 when the practice escalated. More than 2,300 soldiers have already surrendered to the JEP and were released from jail while awaiting trial, according to Defense Minister Luis Carlos Villegas. The government of outgoing President Juan Manuel Santos has fiercely rejected the CD proposal to freeze trials against the members of the military and has warned that extending impunity could trigger intervention by the International Criminal Court (ICC). This proposal is unconstitutional. The appearance before the JEP of former FARC combatants and members of the security forces who have committed crimes in the armed conflict is mandatory. This is indicated in the reform approved by the Constitutional Court. The CD’s attempts to freeze investigations into the systematic and widespread executing of civilians are mainly self-serving, according to Senator Armando Benedetti (U Party), who originally proposed the so-called Procedural Law. “What’s going on is that it’s not in Uribe’s interest that any member of the military speaks badly about him,” Benedetti told weekly Semana. If the “uribistas” continue to stall the implementation of transitional justice, the government will tell the court to disregard Congress and formulate its own procedures. According to Interior Minister Guillermo Rivera, Colombia’s constitution allows the JEP to formulate its own procedures in the event congress is unable to approve the procedural law, which appears to be the case. Rivera is in a hurry; the International Criminal Court (ICC) has been pressing for criminal investigations into the mass killings by the military for years. “If the rules of procedure are not adopted, military personnel would not have clear procedural rules. This generates a lack of action by the national justice system, which leaves the door open for the ICC. The ICC has been investigating war crimes in Colombia since 2002 and has frequently warned that it could assume court cases if Colombia’s own justice system is either unable or unwilling to try war crimes. The court that is based in The Hague, Holland, has already requested the files of 23 generals and nine corporals over their alleged responsibility in the mass killing of innocent civilians.